The Prisoner of Azkaban picks up on Harry Potter’s second summer at home from his second year at Hogwarts School of Witchcraft and Wizardry. After running away from the Dursley’s home after blowing up his Aunt Marge, Harry gets picked up by the Knight Bus and taken to Diagon Alley where he remains there until the school year begins. But before starting his third year at Hogwarts, Harry hears about Sirius Black, a mass murderer known for escaping from Azkaban Prison over the summer. But the worst part is, Sirius has ties to Harry Potter himself, and Harry may not be safe in Hogwarts. I love love LOVE The Prisoner of Azkaban. It’s probably my absolute favorite book in the whole series. I’m going through a re-read stage in life where I’m just reading through old series I never finished and or just want to read again. And I always forget about how absolutely amazing Harry Potter is. I can’t seem to fathom how J.K. Rowling just stopped writing when she created so many characters to just branch off of. This probably being why POA is my absolute favorite. It gives us the taste of the Marauder’s Era with the Marauder’s Map. Being one of my all time favorite magical artifacts, and as well, Remus Lupin is just….the most amazing character ever, going through massive trails in life from when he was young and even now (seeing as Dumbledore hired him because he couldn’t find a job anywhere else). Needless to say, I feel as though yes, Harry could be whiney at points in this book, but it’s really when he starts to begin to grow as a young adolescent. He’s beginning to dip his wand into more advanced magic and is realizing that everything regarding Voldemort and himself is probably going to wind down to a point where it’s just going to be Harry defending himself even though he has a wonderful support system of people who would do ANYTHING to help him out. I also love this book because you begin to see Rowling dipping more into her writing style and growing as an author in the way she describes and builds the backstory and world of Harry Potter. 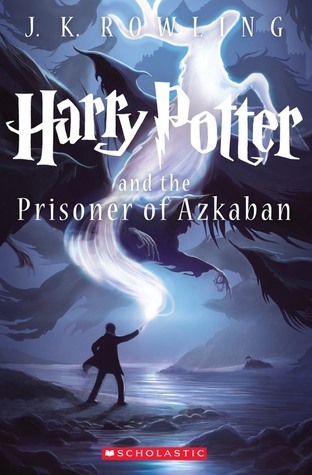 I also think compared to the other two books, Prizoner of Azkaban is really where Rowling starts to kick it up a notch with the action and keeping a reader engaged which makes me really happy. All in all though, I will always give this book a 5/5.